The style-conscious of Glasgow have a new place to shop where the designer and brand-name goods can transform your wardrobe and the life of someone battling bad housing or homelessness. Byers Road is home to the first Boutique by Shelter Scotland charity shop where gems including a Chloé ‘Edith’ handbag and a Liberty of London silk scarf sit in a sleek and simple interior designed by Red or Dead founder Wayne Hemmingway. “People’s generosity in donating and buying from our charity shops allows us to be there to ensure no-one has to face bad housing or homelessness alone. While a brand new bag from Chloé costs over £1,000, the Boutique by Shelter Scotland shop is selling the 2006 model ‘Edith’ for £350, including its branded dust bag, a must-have for collectors. The shop also has stock to catch the eye of fashion forward gents with a mint condition Aldo Conti jacket and a beautiful three-piece Yves Saint Laurent suit. Also on the rails for ladies are a number of vintage items, including a yellow Weatherwear Glasgow LTD rain coat, a Liberty of London silk scarf, and a stunning Emporio Armani evening dress. 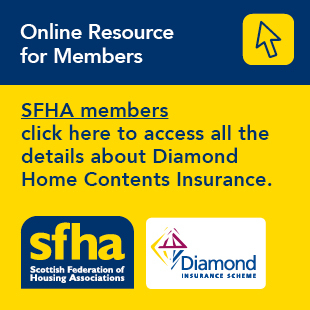 “We helped more than half a million people in Scotland last year with practical advice for people in housing need and a range of campaigns aimed at resolving the housing crisis. Pictured: The ‘Edith’ bag in the new Byers Road Boutique by Shelter Scotland.